Killer Characters: The Busiest Time of the Year - and a #Giveaway! The Busiest Time of the Year - and a #Giveaway! I am nothing but exhausted already! And the Christmas season has only just begun. My shop, Mrs. Claus’s Treasures, was overwhelmed the weekend after Thanksgiving and much of my stock decimated. I have to remember that a strong sales is a good thing! I seriously underestimated the popularity of Alan Anderson’s hand-crafted toy train sets, and I’m going to have to ask him to make me more (a lot more) as super-special order. That’s the nice thing about sourcing most of my products locally. I can go straight to the source. And I never mind spending time with Alan, if you know what I mean. Blush. Back to the topic at hand: it’s Christmas in Christmas Town my favourite time of the year in my favourite place in all the world. I expect to be super busy, but I wouldn’t have it any other way. I hope all the other shops on Jingle Bell Lane in Rudolph do as well this year. In Christmas Town we believe that a rising tide lifts all boats and everyone supports everyone else. Which is why it’s such a worry for us all now that poor Jack Olsen has been taken ill and his miserable son Gord has arrived from California to run the Yuletide Inn, one of Rudolph’s most cherished holiday spots. My dad, Santa Claus himself, got into a very public argument with Gord about the spirit of Christmas Town, and Gord mocked him. I sure hope nothing more happens at this important time of the year that might threaten to ruin Christmas in Rudolph. A very Merry Christmas and Happy Holidays from Vicki Delany and Eva Gates, to all the marvellous Killer Character readers. 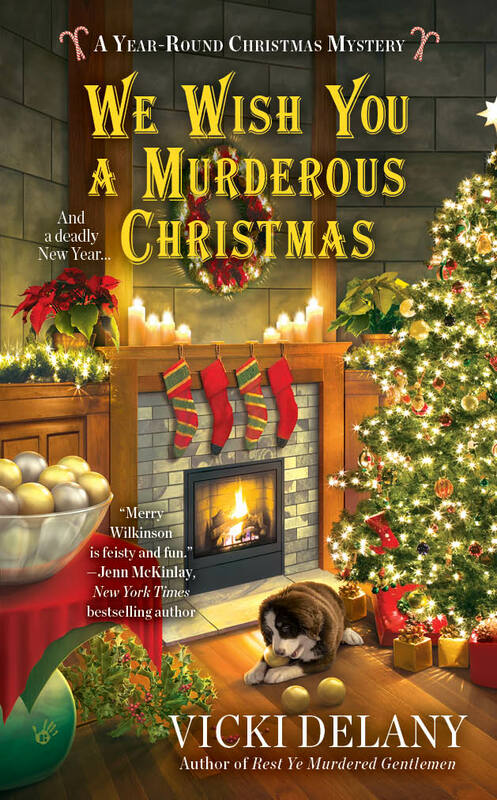 As part of the KC Seasons’ Readings Festivities, Vicki would love to give away a copy of We Wish You A Murderous Christmas, the second book in the Year Round Christmas series, to one lucky reader. Please leave a comment below to enter the contest. Be sure and give us your email address so we can contact the winner. Don’t like putting your email address on the web? Send Vicki an email at vicki@vickidelany.com and mention Killer Characters. Contest ends the evening of December 2nd . US and Canada entries. This is a new to me series. Thanks for the chance! This is new to me. I loved trains as a child. Loved the first one and the clever setting, can't wait to read the new one! Thanks! You are very welcome, Petite! Always love learning of a new series. Thanks for the opportunity. mlarkin at rmr group dot com. Christmas cozies are so fun to read! Thanks for having this awesome give-away. What great memories you must have. I understand about the birds. 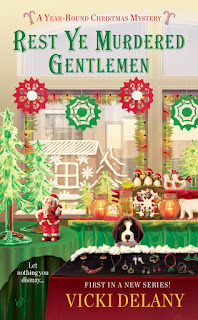 I love Christmas-themed books...this is marvelous! i love reading. Thanks for the chance to be entered in this great giveaway! I love to read Christmas books - especially around the holidays. I've read the first book and need to get the second. thanks. It's never a quiet season when you are a mystery character! I have this series on my wish list. Perfect time to read then. Loved "Rest Ye Murdered Gentlemen" and I'm looking forward to reading "We Wish You a Murderous Christmas". And I'm thoroughly enjoying having an author as a Facebook Friend! Thanks, Vicki! I love Christmas movies and music and stories. Can't get enough. Thanks for the giveaway. Just love cozy mystery books. Christmas ones are enjoyable this time of year. Thanks for the chance to win. It's time to binge on Christmas books. It certainly is that! I love Holmes for the Holidays, a collection of Sherlock Holmes stories. Did you see Matterhorn, the Saint Bernard puppy on the cover? I love cozies with a holiday theme. Thanks for the contest. 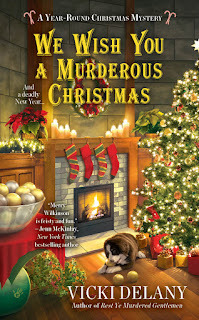 I like Christmas mysteries and the title's good, too. I'd love to visit too! Fortunately, I can do so in my imagination. And so can you. We once lived in a small town that had a Christmas all year 'round store. It was always fun to go inside and listen to the music and look at the decor. The couple also had a utility pay concession so many people went in at least once a month. The man died several years ago, we moved away, and I wonder if the store is still there. I'd like to visit Christmas Town, and especially Mrs. Claus’s Treasures shop. Thank you for the giveaway! Christmas is my favorite holiday! I enjoy this time of year watching the Christmas movies and decorating for the holidays. So many wonderful traditional things to do, aren't there. I love Christmas time and have always enjoyed Christmas stores and their goodies...even though I have more than I need I always wind up getting something, er somethings, new! i suspect we all do that, Kathy. Sounds like a great read for the holiday season! Love reading Christmas mysteries this time of the year. Have a happy holiday season. That's nice to know. Where is your book club located? I read the first book in this series a few weeks ago and loved it. Looking forward to the latest. Don't let Gord ruin the most wonderful time of the year in the most wonderful place! You can count on Merry, Elaine. At least we hope so! Sounds interesting, I would love to read your series. This sounds like a great series. Thanks for a great review and giveaway. Thank you for the chance in this giveaway, looks like something I'd really enjoy. Thank-you for the opportunity. Have a wonderful holiday season! Thanks for the chance of entering the contest! vboudreau57@gmail.com. What fun, Christmas centered cozies. Thanks for this opportunity. I appreciate you giving me the opportunity to win this prize. One can never have too many Christmas books! I read the first book and loved it. I'm not sure if you got my entry, so I'll send you my email address. jnelson1130@gmail.com. Thank you for the opportunity to win this prize. I loved the firs book and am soooo looking forward to the sequel. Merry Christmas! Your books are great. Thanks for the chance to win one. Would like to try this series. Christmas and a mystery all in one book. Sounds great! Thanks for entering my contest everyone! A winner has been chosen and contacted. Merry Christmas and Happy Holidays to you all. I hope Santa puts lots of books under your tree.